We're starting today's post with Sara's Words of Wisdom: You never know where your life is going to lead you, but it will be a place both wonderful and strange. I learned that from Twin Peaks. 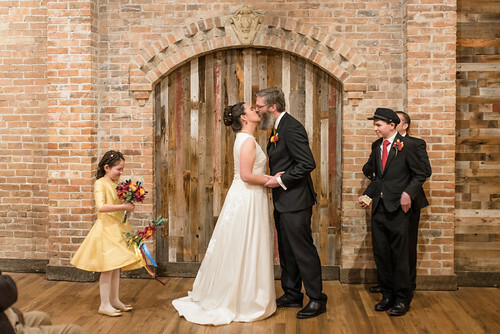 But really, five years ago, I was a teacher, I was married to my college sweetheart, I was living in a tiny townhouse, and I thought my life would always be the same. Now, none of those things are true! 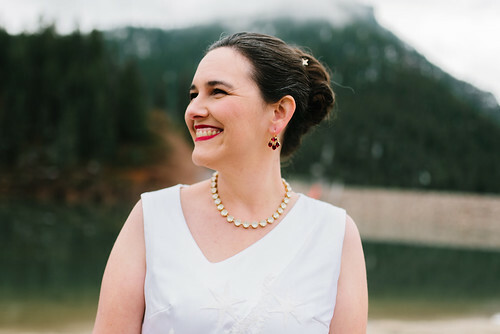 Luckily, my first marriage ended amicably and I learned so many things in the process of going to grad school, moving to a bigger house, and going through a divorce. The biggest lesson to learn was that I deserved a significant other who was present, supportive, and incredibly hot. I found one! 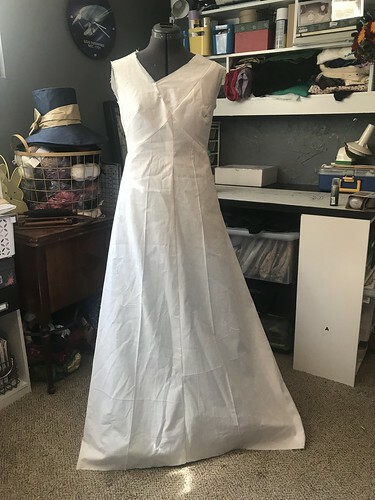 When I got married the first time, I'd only been sewing for a couple of months so I didn't even think about, let alone attempt, making my own dress. 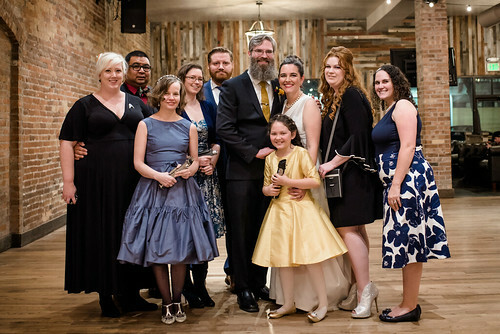 This time around, I've been sewing for well over 16 years and I have a reputation to maintain! 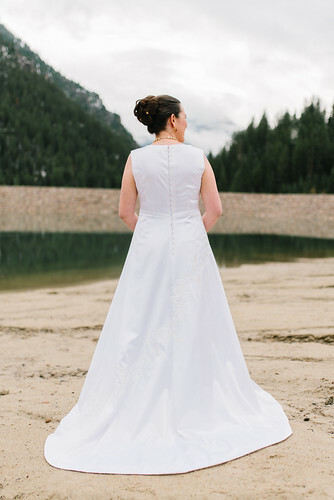 So I sewed my own wedding dress. Spoiler Alert: I do not recommend it. Well, okay that's a lie. 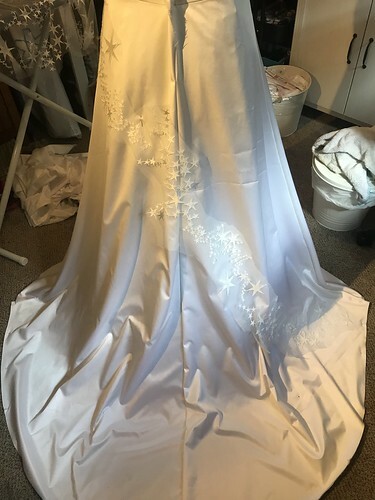 I thoroughly enjoyed designing and making my wedding dress, but doing so on top of making my daughter's dress and DIYing the vast majority of my wedding? 0/10 Would Not Do Again. 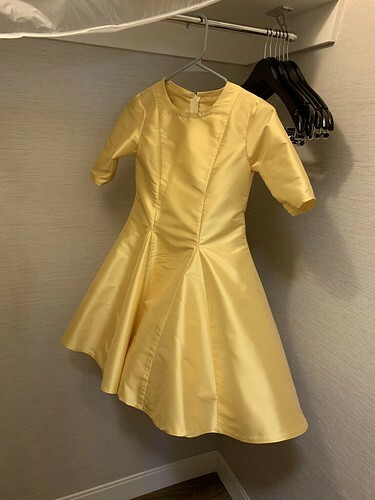 That being said, this dress is my magnum opus and I am already planning how to wear it to costuming events in the future. It's gorgeous and exactly what I wanted so in the end, the pain was worth it. Let's talk about my process! 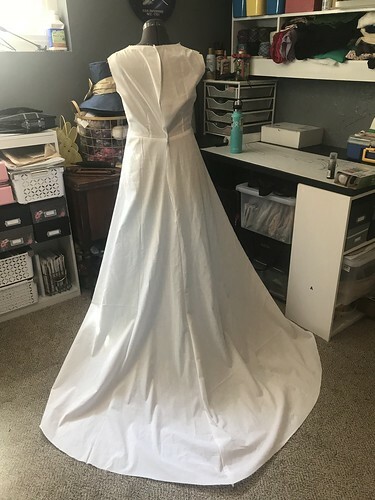 My first mock up looked amazing and even in muslin, I felt like a princess when I put it on. 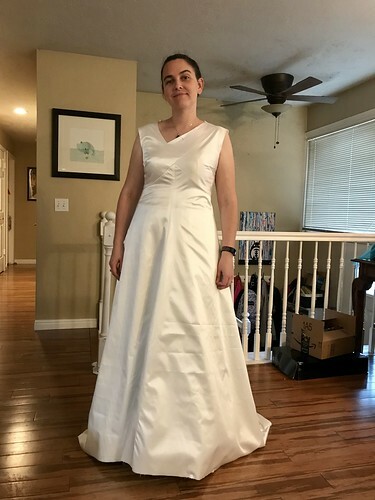 I bought a fused silk satin from Mood Fabrics (aka the most expensive fabric I've ever purchased). 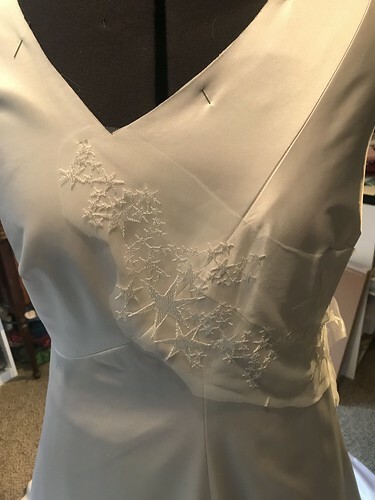 white cotton sateen to line it, and star lace fabric for the embellishments from Etsy. 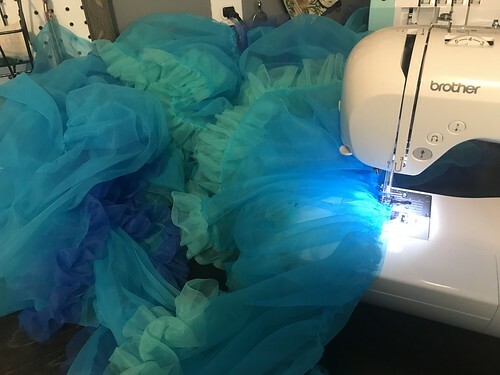 I also decided that I needed a chiffon petticoat to fill out the skirt and give it a bit more umph. I bought nylon chiffon in several shades of blue and went to work. 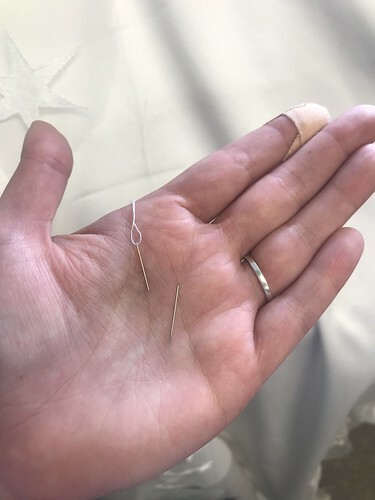 Thank heavens for my gathering sewing machine foot! 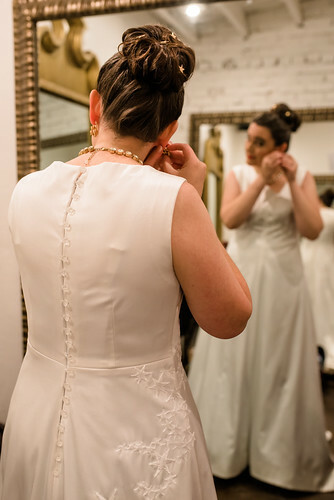 Everything was going swimmingly until the first try on of the actual dress. 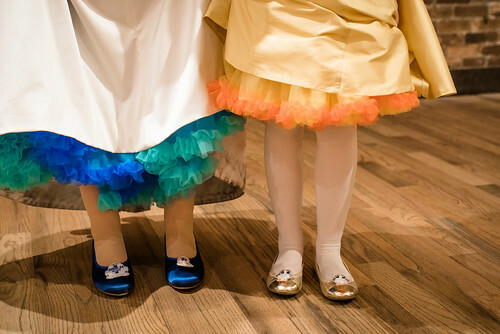 It showed every little lump from my underwear and the gathered waist of the petticoat looked awful. 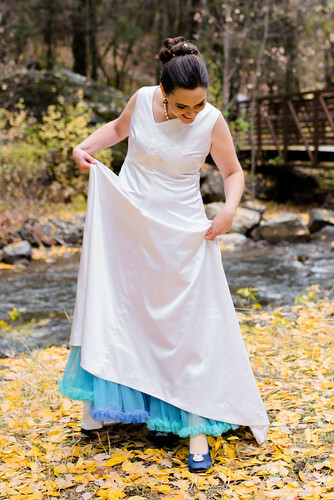 I sought the advice of my costuming friends, then ripped the waistband off the petticoat and made it into a full slip. It made a HUGE difference. 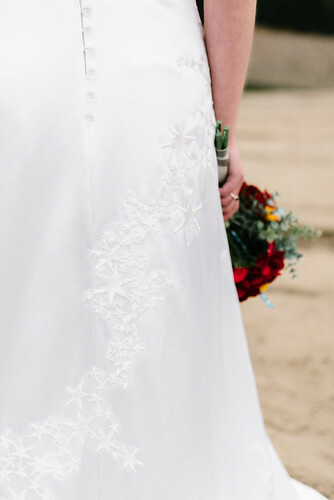 Once that crisis was averted, I started messing around with placement for the star lace. This part was really fun, but I spent way too much futzing. I only managed to get about half the appliqués done so I might go back and add the rest for a costume event wearing sometime. 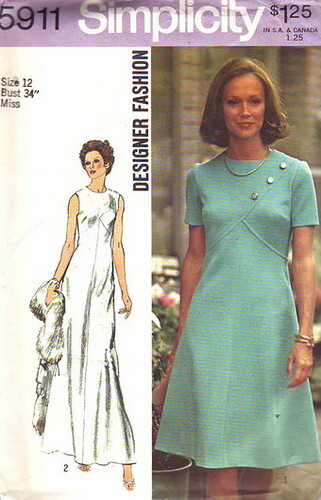 The dress closes with a zipper and a row of vintage Czech glass buttons. The buttons were dead stock and I almost hated to take them off the card! They're shaped like little hexagons, which is my husband's favorite shape (yes, he has a favorite shape) and I just love how they look. 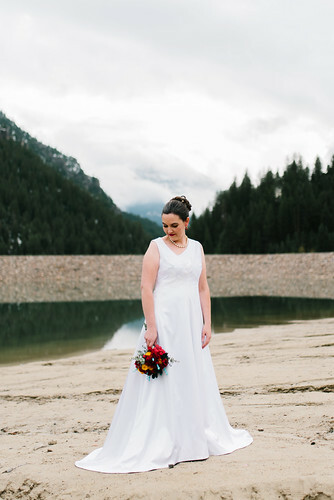 The dress came together beautifully! It's accessorized with the Amelie pumps from American Duchess and gorgeous jewelry from Dames a la Mode. 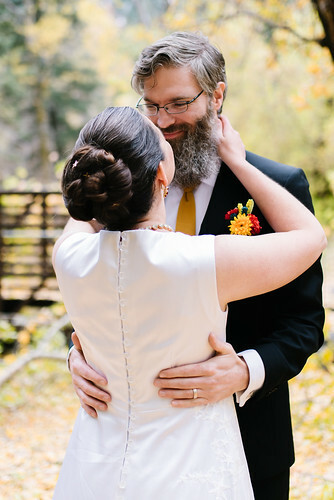 It was so comfortable to wear and Jenny-Rose's arrangement of my hair was actual perfection. It was worth every bit of stress and pain. I added sleeves and made her a cute little chiffon petticoat as well. She's the sun to my stars! 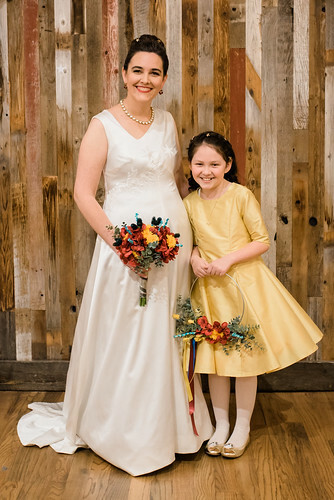 We both had the perfect dresses for a perfect night.